plasma thromboplastin antecedent (PTA) factor XI, one of the coagulation factors. in the clotting of blood, also known as plasma thromboplastin antecedent, a component of the contact system that is absorbed from plasma and serum by glass and similar surfaces. Its active form, factor XIa (EC 3.4.21.27), is a serine proteinase converting factor IX to factor IXa. Deficiency of factor XI results in a hemorrhagic tendency; is caused by an autosomal recessive gene. See factor XI. This term is no longer in common usage. A plasma coagulation factor; a component of the contact system that is absorbed from plasma and serum by glass and similar surfaces. Deficiency of factor XI results in a hemorrhagic tendency. In blood clotting, a component of the contact system that is absorbed from plasma and serum by glass and similar surfaces. PTA; clotting factor XI. See plasma thromboplastin antecedent. the fluid portion of the blood in which corpuscles are suspended. Plasma is to be distinguished from serum, which is plasma from which the fibrinogen has been separated in the process of clotting. many electrolytes exist in plasma in a form in which they are bound to protein which reduces their lability and liability to loss in the urine, e.g. protein-bound iodine. see feline plasma cell gingivitis-pharyngitis. a nonpainful swelling with ulceration and exuberant granulation tissue on the footpads of cats. The cause is unknown but believed to be immunological. 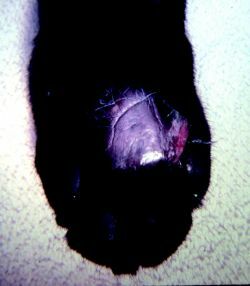 Plasma cell pododermatitis in a cat. a lipoprotein lipase which lipolyses the triglyceride in the chylomicrons of the plasma and hence clears it of cloudiness. the removal of plasma from withdrawn blood (plasmapheresis) and retransfusion of the formed elements and type-specific fresh-frozen plasma into the donor; done for removal of circulating antibodies or abnormal plasma components. prepared from whole blood; a source of coagulation factors. the heterologous group of proteins in circulating blood that includes albumin, lipoproteins, glycoproteins, transcortin, haptoglobin, ceruloplasmin, cholinesterase, α2-macroglobulin, erythropoietin, transferrin, hemopexin, fibrinogen, plasminogen and the immunoglobulins (γ-globulins). an indicator of significant changes in fibrinogen levels, taking into account dehydration. a fluid suitable for use as a replacement for plasma in the animal body. Usually a solution of gelatin or dextran. a therapy-response relationship determined only by experiment; the plasma level which is matched by the desired therapeutic response. clotting factor XI; see plasma thromboplastin antecedent. a qualitative test for fat absorption, performed by comparing the turbidity of plasma before and 2, 3 and 4 hours after the oral administration of fats, usually vegetable oil. Results are greatly influenced by delays in gastric emptying, so normally this test can only be relied upon to rule out malabsorption or maldigestion when evidence of absorption is found. the estimation of plasma volume is essential to a complete knowledge of a patient's fluid status. The common technique is by the intravenous injection of a known amount of a dye such as Evans blue and the subsequent measurement of the dilution that it has undergone in a set time period.